Illustrated with extraordinary new photography, this is the definitive field guide to all of New Zealand's tuatara, geckos, skinks, frogs, marine turtles and marine snakes. From the ancient tuatara, the sole surviving member of its order, to the world's largest collection of long-lived and live-bearing lizards, our geckos and skinks, New Zealand's 123 species of reptiles and amphibians represent an extraordinary aspect of this country's biodiversity. 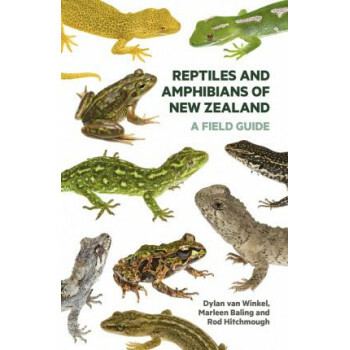 Reptiles and Amphibians of New Zealand is the only field guide to cover all currently recognised species. Key features include: Expert and up-to-date information on all 123 species of reptiles and amphibians in New Zealand. More than 400 new photographs. Range maps for every species. Introduction to evolution, conservation, observing and collecting, ecosystems and geographic history. Authoritative text on every species, including names, description, distribution, variation and similar species, habitat and natural history. Identification keys for each of the major groups. Regional checklist and a handy quick guide on the inside flaps.